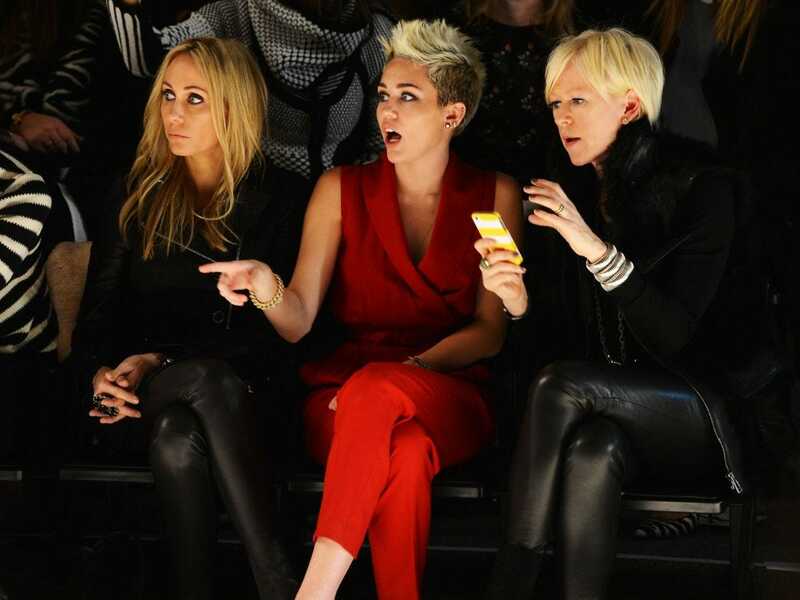 Hollywood invaded New York for this season’s Fashion Week showcasing designer lines for fall 2013.Miley Cyrus and Willow Smith sat front row with their mums, Rachel Zoe’s latest accessory is her son and Heidi Klum still knows how to work a runway. See which celebrities attended which runway shows and of course, what they wore. Christina Ricci went for a crop top for Marc Jacobs' Fall 2013 fashion show during Mercedes-Benz Fashion Week. Not to be outdone, Miley Cyrus showed off her toned tummy next to designer Marc Jacobs while backstage after his show. A day prior, Cyrus, sitting in between her mother and Cosmopolitan editor Joanna Coles, looked surprised by the Rachel Zoe fashion show. Hilary Swank, Zoe Saldana, Jada Pinkett Smith and Willow Smith were all seated front row at the Michael Kors Fall 2013 fashion show. Model Karlie Kloss towered above Hilary Swank backstage at the Kors show. Vanessa Hudgens looked up to Brooke Shields in the Mercedes Benz Star Lounge in Lincoln centre. Kristin Chenoweth looked tiny next to model Heidi Klum backstage at the Project Runway Fall 2013 fashion show at Lincoln centre. Vanessa Hudgens is the same height as Alice + Olivia designer Stacey Bendet, while Julie Henderson towers above. Model Chrissy Teigen and fiancé John Legend scoped out dresses at the Vera Wang show. Chrissy Teigen later looked on excitedly while seated next to Jada Pinkett Smith, Olivia Palermo, John Legend and Rachel Roy at the Vera Wang show. Rachel Zoe and her son Skyler prepare backstage at the Rachel Zoe Fall 2013 fashion show. Katherine Heigl hams it up backstage at the J. Mendel show. 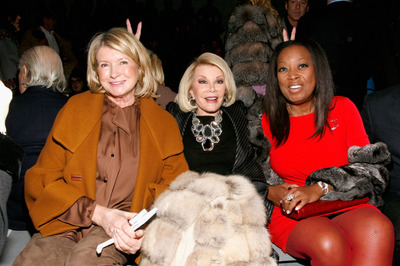 Unlikely trio Martha Stewart, Joan Rivers and Star Jones attended the Dennis Basso show. Note the bunny ears. Newly engaged Olivia Wilde and Oscar nominee Jessica Chastain attended the Calvin Klein show. Carmen Electra stands out next to Kevin and Danielle Jonas at the Pamella Roland show. Rosario Dawson attended the Boy Meets Girl by Stacy Igel fall 2013 fashion show during Conair Style360 at Metropolitan Pavilion. Singer Eve and Ashlee Simpson attended the Nicole Miller Fall 2013collection debut. It's a Carmen Electra sandwich at The Blonds fashion show. Project Runway Judges Zac Posen, Heidi Klum, and Nina Garcia pose with fashion designer Michael Kors on the runway at the Project Runway fashion show at Lincoln centre. Heidi Klum will be back.